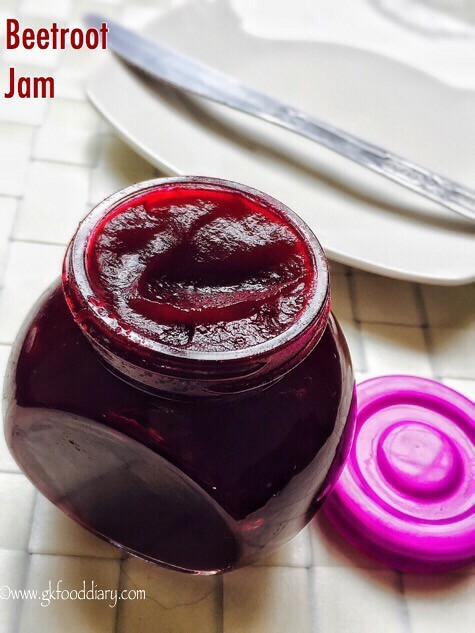 Beetroot Jam – homemade preservatives free, pectin-free jam recipe with Beetroots! 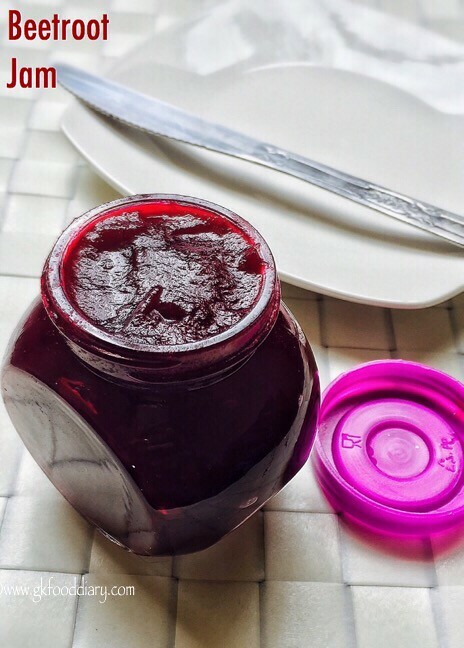 This beetroot jam is my favorite from childhood and its one of those my mom’s trademark dishes. I am sure this a best way to make kids eat beetroot! Check out my strawberry jam & pineapple jam, Carrots Jam, mixed fruits jam recipes too. 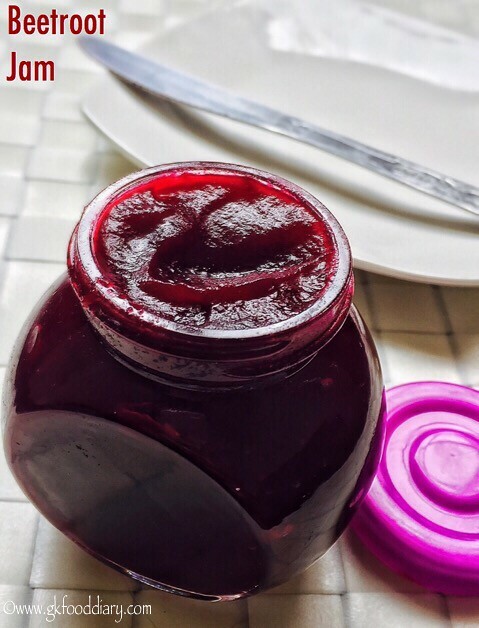 You could consume few teaspoons of this beetroot jam with whole wheat bread, idli, dosa or even roti. We like it with curd rice too! 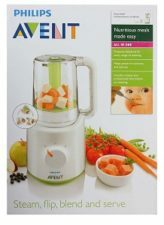 This beetroot jam is ideal for babies above one year! Now Let’s get on to check how to make this homemade beetroot jam recipe for toddlers and kids. 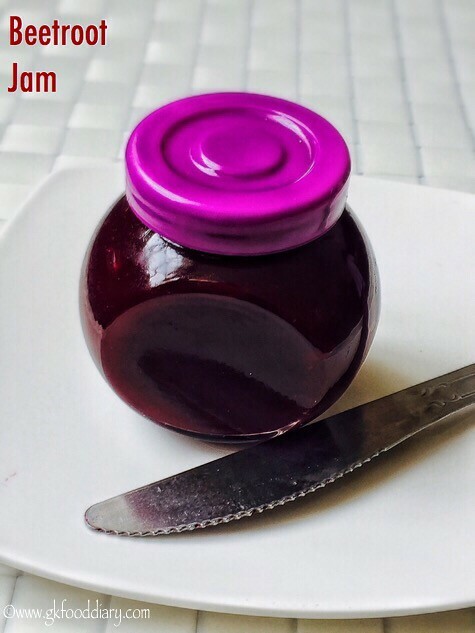 Homemade Beetroot Jam - easy, preservative-free jam recipe with beetroots and palm sugar/brown sugar/powdered jaggery. Wash the beetroot in running water thoroughly. Place it on a cutting board and peel the skin. Then cut them into small pieces. Keep sugar & lemon juice ready. Transfer the chopped beetroot pieces into a pressure cooker. Add little water as needed for pressure cooking. Pressure cook it for three whistles and switch off the flame. 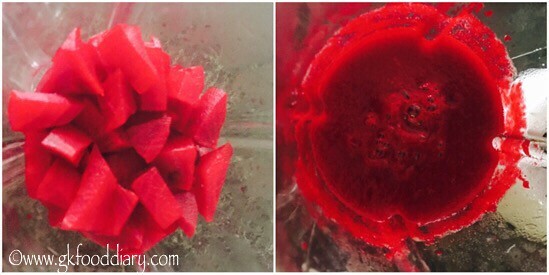 Once pressure released, open the cooker and transfer the cooked beetroot pieces to a blender along with lemon juice. Blend everything until smooth. Add the water used for pressure cooking while grinding if necessary. Transfer the beetroot puree into a pan and add sugar/jaggery powder. Mix well. Cook, it closed. Open and stir it Occasionally for 10-15 minutes until it reaches jam-like consistency. Keep the flame low to medium to avoid burning at the bottom. Switch off the flame once done. Cool it down and store it in a sterilized glass container. 1. Wash the beetroot in running water thoroughly. Place it on a cutting board and peel the skin. Then cut them into small pieces. Keep sugar & lemon juice ready. 2. 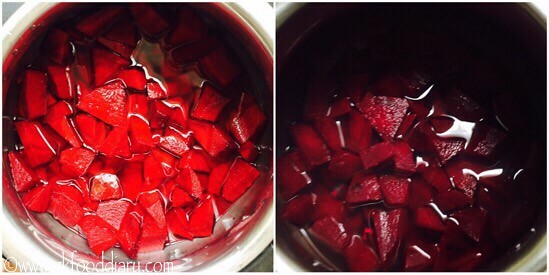 Transfer the chopped beetroot pieces into a pressure cooker. Add little water as needed for pressure cooking. Pressure cook it for 3 whistles and switch off the flame. 3. 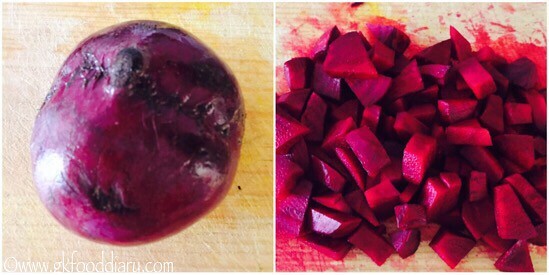 Once pressure released, open the cooker and transfer the cooked beetroot pieces to a blender along with lemon juice. Blend everything until smooth. Add the water used for pressure cooking while grinding if necessary. 4. 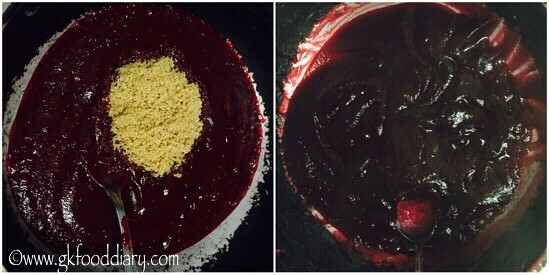 Transfer the beetroot puree into a pan and add sugar/jaggery powder. Mix well and cook it closed. Open and stir it Occasionally for 10-15 minutes until it reaches jam like consistency. Keep the flame low to medium to avoid burning at the bottom. Switch off the flame once done. Cool it down and store it in a sterilized glass container. Delicious homemade beetroot jam is ready! Hope you liked this recipe! To get regular updates, do like my facebook page GKFoodDiary or follow me through Google+, Twitter & Pintrest! Make sure your kid is not allergic to beetroot before you try this beetroot jam. The quantity of the sweetener depends on the sweetness of beetroot. Check and adjust after pureeing the beetroots. You can use white sugar instead of brown sugar/powdered jaggery. But to make it healthy, I recommend brown sugar or jaggery.